Over the years, the rules of ice hockey have changed. But one thing has remained at the centre of the game: the puck. It was invented in Canada, but most of the black discs used today are made in the Czech Republic. A report from the rink. Body checks, unbridled punch-ups and hard fouls – ice hockey players the world over are as hard as nails. The real stars among the players lose the occasional tooth in the free-for-all for the puck. And yet a gap-toothed smile is a badge of honour for the tough guys cutting the hard steel runners of their ice skates into the rink. At the centre of the wild goings-on on the ice rink is the puck – and it too needs to be able to endure quite a battering. Slapshots see this black disc catapulted over the ice at up to 170 km/h. It is a made-to-measure piece of equipment.  The dimensions of the hard rubber puck are specified by the International Ice Hockey Federation (IIHF) in their rule book: exactly 2.54 centimetres (one inch) in height and with a diameter of 7.62 centimetres (three inches). The term ‘puck’ is derived from the Scottish-Gaelic word ‘poc’, meaning ‘strike’ or ‘shot’. The game with the puck has a long history: precursors have been around in Canada for centuries, and in Europe since the Renaissance at the latest. The French colonisation of Canada saw Indian ball games being combined with the lacrosse so passionately played by the French soldiers. The term ‘hockey’ also originates from French, and means ‘bent stick’. During British rule of Canada in the mid-18th century, the game migrated from grass to ice, and new elements came to influence the game. Goals and lines were introduced, and the rules of the game continued evolving. 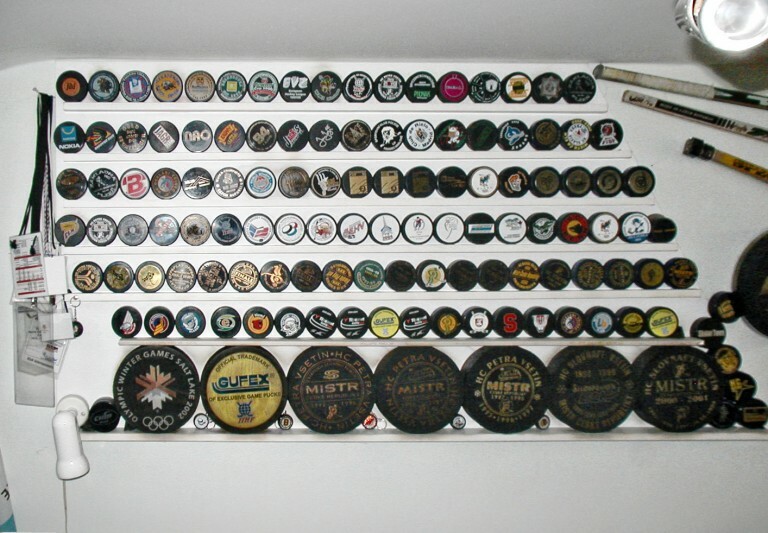 The Czech company GUFEX is the producer of more than one million pucks annually, exporting the black discs worldwide. Pucks bearing the logo of the Olympic Games are particularly prized by collectors. The modern game of ice hockey with all its rules evolved around 140 years ago in Canada. Students at McGill University in Montreal founded the world’s first ice hockey club. Their first documented, and widely observed, ice hockey game was played on 3 March, 1875. An audience of more than 500 at the huge Victoria Skating Rink was witness to two teams battling on the ice. Winning proved extremely difficult, as a ball was still being used for play. The rubber ball bounced off the rink frustratingly often during this first official match, and proved difficult for the players to control. Another two years passed before McGill student William Fleet Robertson had his decisive idea. In 1877, he took the rubber ball that had been used up until then, and simply cut off one of the two sides. The disk he was left with slid across the ice considerably more easily than any of the balls they had been using. The flat, hard rubber object was quickly adopted for the game. When Robertson and his fellow students formulated the rules of the game soon afterwards, the disk had already become an integral component of the game. The puck was invented in Canada. The term ‘puck’ is derived from the Scottish-Gaelic word ‘poc’, which means ‘strike’ or ‘shot’. A puck may only be made of a few materials, and the rules of the IIHG now define the specifics. A rubber compound made of latex, the milk of the rubber tree and sulphur are the main components. The secret of production is vulcanisation, during which this rubber compound is heated. Heat and pressure combine to shape the product and make it elastic. The rubber always returns to its original form even when subject to stress – otherwise the puck would be bent out of shape after every strike. The Czech Republic plays Russia in the final of the World Championship 2010 in Cologne: Czech players Tomáš Rolinek (right) and Jan Marek (left) are battling with the Russian Pavel Datsyuk for the puck. The Czech Republic won 2–1 to become world champions. The pucks for almost every major tournament since the Olympic Winter Games in Nagano in 1998 have been made in the Czech Republic. 1998 was the first time when Olympic matches were played on the ice using pucks made by the GUFEX company. As if to crown this business achievement, the Czech team also brought home the gold medal that year. The Czech company has also been the official, licensed supplier of all tournaments played under the governance of the IIHF since 1999, such as the World Championships. GUFEX has just seven regular employees and a few casual workers, even though this small family-run company sells more than one million of these small black discs all over the world every year, and not only to countries where ice hockey is popular, such as Russia, Canada and the United States. It also sells to places such as Chile and Australia. 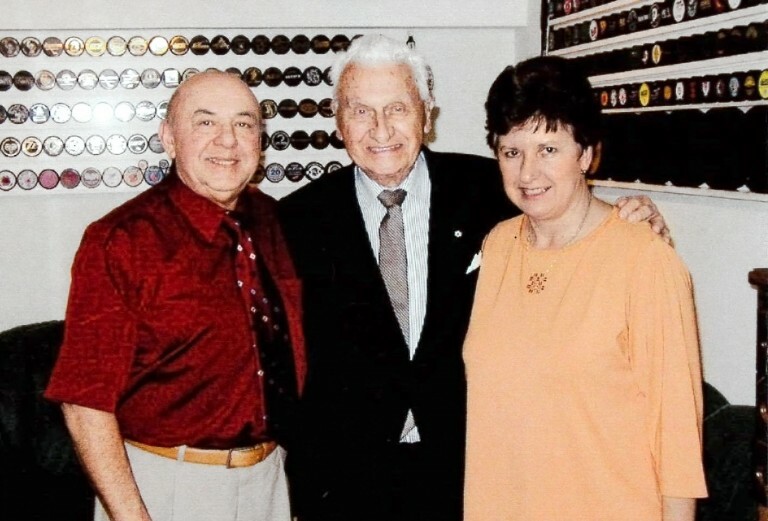 National teams play with the pucks made by his company, GUFEX: Pavel Mráček (left) with his wife Lenka and Tomáš Baťa, the head of the internationally renowned Czech brand Baťa. Both are family companies that export their goods worldwide. 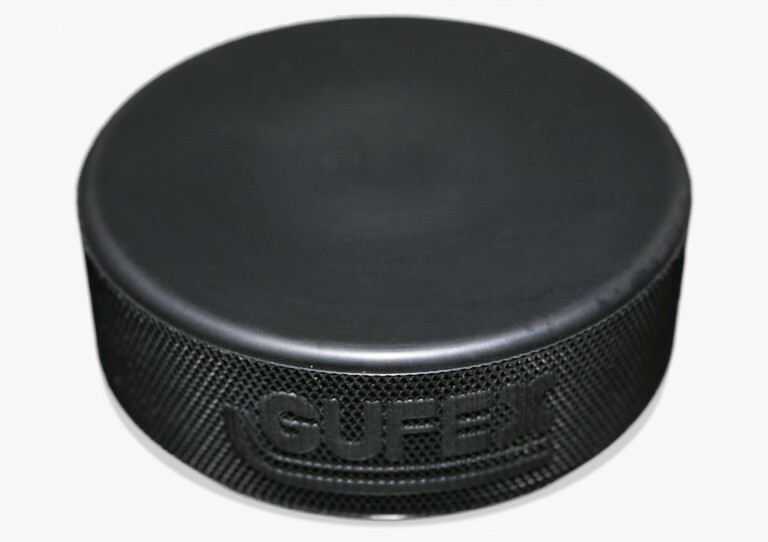 The most distinctive feature of the pucks made by GUFEX is that they leave barely any black marks on the ice. “For a long time, we kept the formula locked in a safe deposit box at a bank, but now we’ve brought it home. Nevertheless, it is still a secret, of course,” Michaela Blažková explains. Together with her mother and sister, she manages the company that her father, Pavel Mráček, founded in 1990. The headquarters of the company is in Kateřinice, a village at the eastern edge of the Czech Republic. Hockey pucks were not one of the products offered by GUFEX when it was first founded. Mráček started off in his garage producing sealing rings, spatulas and washbasin plugs. It was only three years after founding the company that Mráček, a diehard supporter of the ice hockey club VHK Vsetín, even thought of trying his hand at pucks. He tested the properties of his pucks on the ice at the Vsetín stadium and kept optimizing the material until both he and the players were happy. 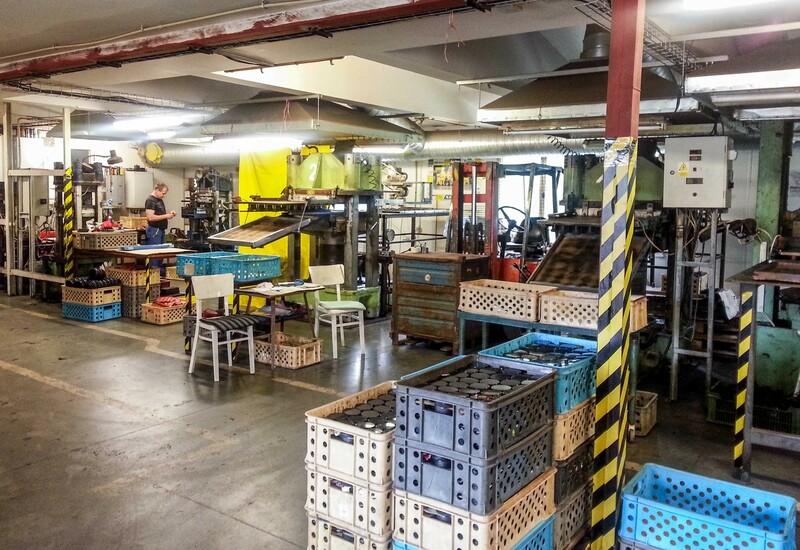 GUFEX, a family company, produces its pucks to a secret formula. Production began in a garage in the small village of Kateřinice in the eastern Czech Republic, but today’s production lines are a little more modern. The dimensions of the puck are specified by the International Ice Hockey Federation in its book of rules: the puck must measure one inch (2.54 cm) in height and have a diameter of 3 inches (7.62 cm). The weight can vary from 156 grams to 170 grams. Also defined is the size of the logo on a puck. While it may be printed on both sides, the image must occupy only 35 per cent of the side surfaces of the puck. The puck is made of hard rubber and can slide across the ice at up to 170 km/h. The size and weight are defined to international standards issued by the International Ice Hockey Federation (IIHF). This claim to fame is still paying off today. “While our products are slightly more expensive than those of the competition due to the material mix, either the customer knows to value our endeavours to produce quality, or buys a puck made by a cheaper competitor,” is how Blažková analyses the situation. Furthermore, pucks with minor faults in the design, colour scheme or structure are only sold as training pucks. “On the one hand, I’m really proud of what we’ve achieved as a small company. On the other hand, the fact that the name is much bigger than the company itself is what instills a healthy respect in us too,” Blažková says. The hockey puck that GUFEX produced for a number of Olympic Winter Games is a valuable item for collectors. Experts distinguish between the game’s official puck and souvenir pucks. While both are normal ice hockey pucks, the pucks used in the game are approved by a league, or by the IIHF, and usually feature distinctive logos. Because the pucks used for games played at World Championships and the Olympic Games cannot be purchased, they often go under the hammer for prices of up to €1,000 at auctions. Pucks are not only produced for different occasions, but also for different purposes (see box “Puck variations”). Officially, their weight may vary from 5.5 to 6 ounces (156 to 170 grams), but there are also lighter pucks available in blue for children, and an orange disc weighing 283 grams is used by players to practice their shots and stick-handling skills. Blue Puck: For children too young to play properly with a standard puck, there is a lighter puck weighing 113 grams (4 ounces). Orange Puck: To practice shots and improve hockey stick skills, a heavier puck weighing 283 grams (10 ounces) is sometimes used. Steel Puck: To improve strength in the wrist, for example, a puck made from steel and weighing 900 grams is used. This puck must not be used in a game, only for training. Illuminated puck: In 1983, Eberhard von der Mark developed a puck with an LED, which flashed for a few seconds when the puck was struck. However, this variation never advanced to become standard. Prominent advertisements for ŠKODA on shirts and perimeters at the Ice Hockey World Cup 2015. 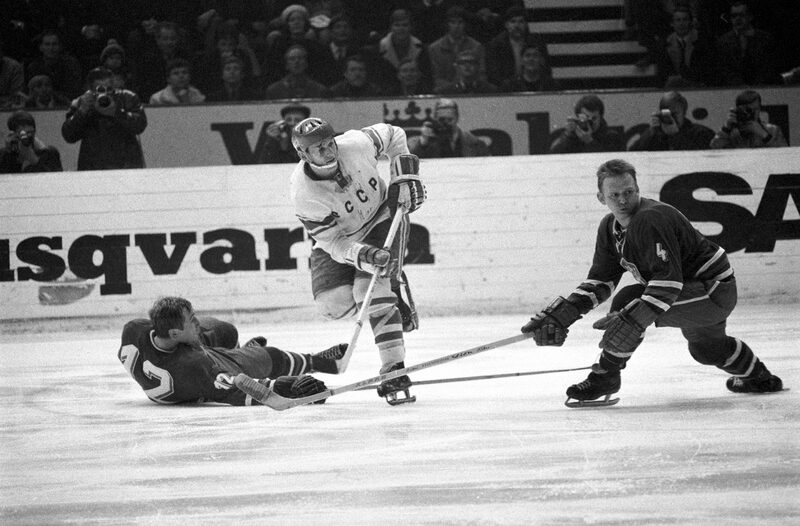 The Czech ice hockey star Jiří Novotný (wearing 12) in a duel during the match between Austria and the Czech Republic. The Czech Republic thrashed Austria 4–0. Much thought has been put into adding some technology to the puck’s interior. This has resulted in various attempts to make the fast-moving rubber disc more easily visible for TV audiences. In the 1980s, a German, Hardy von der Mark, patented an illuminated puck that emitted a flashing signal from in-built LEDs for a few seconds after being struck. This invention failed to catch on, and neither did the ‘electronic puck’ developed by US TV network Fox in the 1990s. This electronic version made a blue or red mark on the television screen, depending on the force with which it had been struck. TV audiences, however, associated it with a video game and were not impressed by the new technology. Formally, in ice hockey, an own goal can’t be scored, and the goal will be credited to the player on the attacking team who last had contact with the puck. A goal is only valid when the full diameter of the puck has crossed the goal line, and the referee has seen the puck behind the goal line. Moving the puck using an ice skate is permitted, as long as no goal is scored by doing so. Stopping the puck, or striking it away, using the hand is allowed. Within a team’s own third line, it is allowed to pass the puck to a teammate by hand. A legendary ice hockey photo from the 1960s: international star Bobby Hull from the Chicago Blackhawks just scored his 50th goal in one season with this puck. 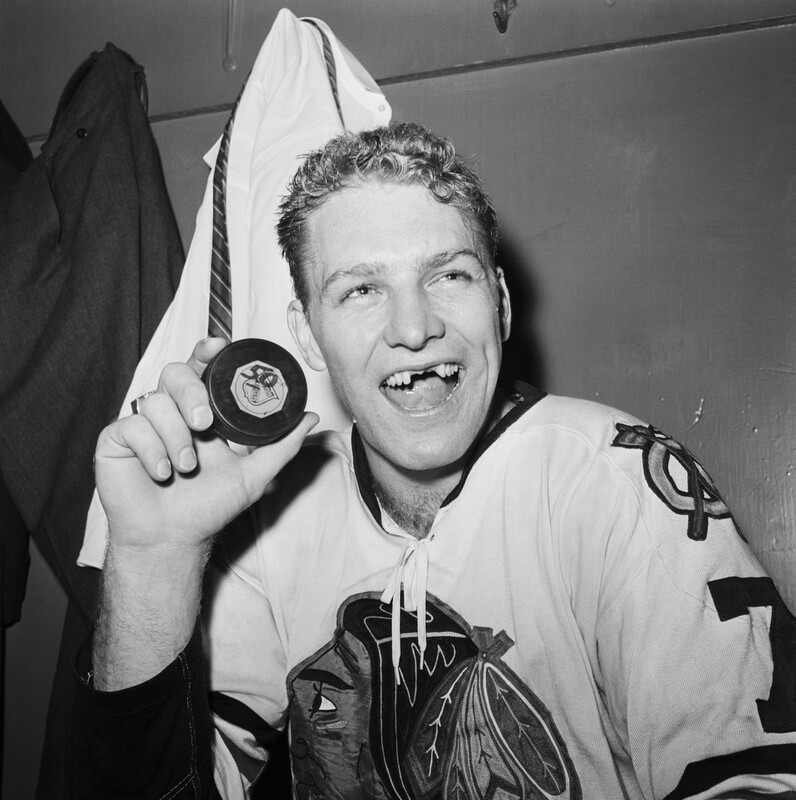 A puck was also responsible for the gaps in his teeth when “the Golden Jet” smiled – a badge of honour in ice hockey. Photo: Corbis, CTK Photo/Imago, GUFEX s.r.o., ŠKODA AUTO a.s.